Outlining the remarkable achievements of the experimental design group of the Academy of Fine Arts in Warsaw is a very difficult task. The reason is not the complexity of the concepts created by the group members as such, but the fact that most of their works have not survived to the present day. Acquainting students of artistic academies with specific tasks concerning architecture and applied arts, establishing a close link between theory and practice, familiarising with the benefits and difficulties of group work: that's how the aims of Artistic and Research Unit of the Academy of Fine Arts in Warsaw can be defined. The Artistic and Research Unit of the Academy of Fine Arts in Warsaw 'ZAB' (in Polish: Zakłady Artystyczno-Badawcze) was created in 1954 at the Faculty of Interior Design of the Academy of Fine Arts in Warsaw. Among the members of the organisation there were professors, graduates and students of the Academy. ZAB, functioning basically on the margin of the Academy's main scope of activity, was supposed to be a 'forum for creative cooperation' of representatives of different specialisations: architecture and urbanism, painting, design, sculpture and engineering. The artists worked in teams and carried out multidisciplinary projects that had been commissioned to them. The essence of ZAB's work was combining practical, commissioned work with theoretical research. The objective of the Unit's work is to learn discipline, exactness and respect for the technique. The aim is also to reveal the beauty and emotions of a seemingly prosaic topic and refrain from decoration – that is, to achieve an artistic effect thanks to the use of other means, related with function, structure and material. We also want to reject superficiality, glitz and showy artistic junk. And what's most important: we want to establish as close a relation with reality as possible. The decision to employ the architect Jerzy Sołtan (…) that was made during the Senate on October 18th, 1948 was, together with introducing the Kapists with their specific conception of a master's workshop (…), the most important event in the Academy's history in the discussed period. Between 1940 and 1945 Sołtan was in the oflag in Murnau. While in detention, he started corresponding with Le Corbusier. Just after escaping the camp in August 1945 he got to Paris and started collaborating with the father of modernism. The 4-year-long work with Le Corbusier influenced not only Sołtan's views or projects, but also made him famous for being the only Pole who had worked with the most important figure in architecture at that time. Thanks to this, when he came back to Poland in 1949, he could remain independent to a certain degree in spite of the ruling doctrine. Thus, founding ZAB and establishing an innovative system of work was a way to avoid the imposed stylistics and function independently of the socialist realism architecture. The Artistic and Research Unit was not a single structure: it consisted of many collaborating teams. However, the ones who played the first fiddle were Jerzy Sołtan and Zbigniew Ihnatowicz (the two architects met in the oflag in Murnau), at least in the initial – the best and the most interesting – period of ZAB's functioning. Sołtan's team won the 1st prize in the competition for the project of the 'Warszawianka' sports complex and it served as a justification for founding the Artistic and Research Unit. This complicated concept that combined urbanism, landscape architecture, architecture and art is considered one of the best projects of that time (today the devastated area was partly developed, but there are also attempts to recreate Sołtan's team's idea in the remaining part of the complex). 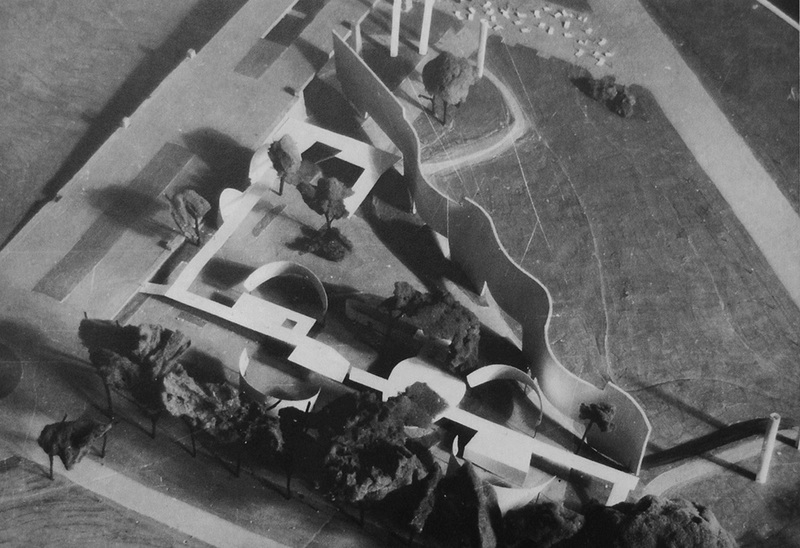 The unrealised concept of the Polish pavilion for the world's fair EXPO in Brussels (1958) is a good paragon of the synthesis of art that ZAB's members wanted to achieve. Sołtan and Ihnatowicz designed it in collaboration with Lech Tomaszewski (the construction of the pavilion's covering), Wojciech Fangor (painting), Tadeusz Babicz, Zenon Januszewski, and Stanisław Hempel. An integral part of the pavilion was supposed to be… music, specially composed for this occasion by Stanisław Skrowaczewski. Sołtan's team made plans to place the openwork construction of the roof over the exposition area in a way that there would be no necessity to build permanent constructions and cut out trees. Under the roof they wanted to place Fangor's enormous decorative panneau and wavy walls on which looped film sequences synchronised with music would be projected. Thus, the Polish pavilion would not be a building but a spatial composition integrated in the existing landscape. It would appeal to different senses and differ significantly from the traditional expositions, composed of texts and exhibits. In 1958 Sołtan, Ihnatowicz, Tomaszewski and Jerzy Brejowski designed a warehouse called Powszechny Dom Towarowy Dukat in Olsztyn. Although the function of the construction seems ordinary, the designers shaped it in an elaborate way. The complex consisted of three buildings: a department store, a self-service bar and an office block which were contrasted with each other. The commercial part had smooth and shiny elevations and the office part was more 'sculpted' with concrete, prefabricated columns. The cube and the cuboid were separated with a clearance and the whole was finished with carefully selected materials: wood, glass, steel and brick, impactful thanks to their colour and texture. The richness of the artistic solutions was combined with a modernist construction. 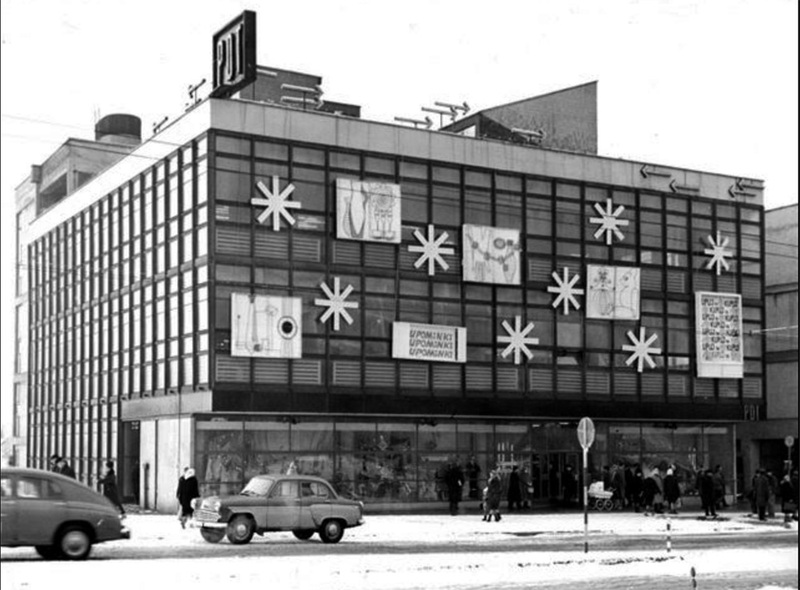 The result was a unique building which went beyond the standard form of a typical department store. Unfortunately, in 2011 the complex was drastically rebuilt and the designers' concept was destroyed. The project guaranteed the building's functionality above all. Because of a great diversity of the surrounding constructions, the designers opted for a building with simple geometrical forms, strong colours corresponding with particular types of structural elements (the load-bearing walls made of ceramic bricks, the elements of the covering made of concrete with washed surface and the light walls made of glass with charcoal grey frame). The pavilion stood out due to its clear, orderly form, consciously completed with diverse materials. As Zbigniew Ihnatowicz put it, the pavilion was designed as a 'conscious protest against the superficial treatment of the form’, 'tachist kidneys', 'Mondrian-like grids'. This refined modernist building also disappeared: after a drastic reconstruction between 2000 and 2002 (the pavilion was turned into an office block). 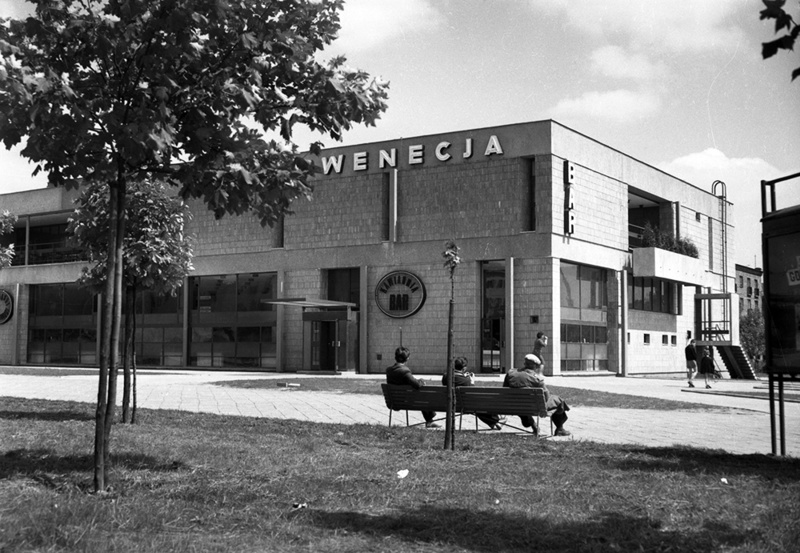 There were many remarkable artists from various domains, not necessarily associated with architecture, working in the Research and Artistic Unit, such as Jerzy Nowosielski and Magdalena Abakanowicz (she designed four pylons placed at the entrance of the Poznań Fair; they were made of fluorescent painted ropes). From 1958 Jerzy Sołtan added design to ZAB's scope of activity. In a small room in the Academy of Fine Arts building on Myśliwiecka street there were meetings and joint conceptual work taking place. Jerzy Sołtan's students played an important part in the process of designing. The works that the artists carried out were often commissioned: they designed a model of a handle for the company Elbud, a brush for vacuum cleaning for Predom and a case for the first transistorized computer for the Polish Academy of Sciences. The objective was to find a solution with the use of simple methods. The team wanted to present an opposite attitude to the one that is very frequent in the whole world, also in Poland, and which is based on the use of a profusion of colours and complicated spatial elements with very complex geometry. 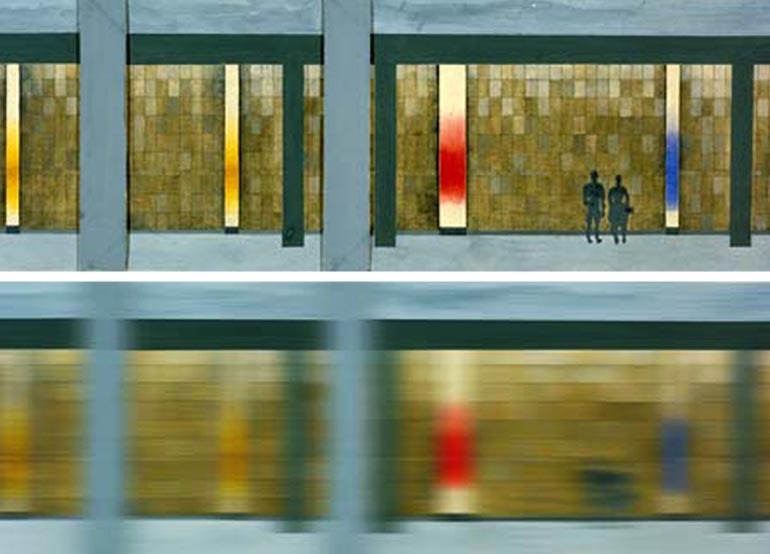 These evenly placed slits (…), the most strongly illuminated elements of the whole elevation, seem to be overlapping elements of the solar spectrum when seen in movement and being even more quickly covered by the moving foreground. All these abstract colouristic compositions were designed in mosaic by Wojciech Fangor. Unfortunately, today the complex and well-thought out artistic composition of the interior of the station is less and less visible: some of its elements were devastated, others disappeared after renovations and modernisations. More or less from the mid-60s the Artistic and Research Unit started to go into decline. That was due to the changes in the regulations of the functioning of the organisation introduced by the authorities of the Academy of Fine Arts. On the one hand they expected ZAB to be financially self-sufficient, on the other they wanted to limit its scope of activity (the authorities put more emphasis on theoretical works and did not like the idea of students taking part in the Unit's activities: they preferred them to work on design or interior design projects). The real reason of the dissolution of ZAB and the depletion of the designing concept that had been developed there was the fact that Jerzy Sołtan, spiritus movens of the organisation, left Poland (in 1959 the architect became lecturer at Harvard University, and in 1967, the dean of the Department of Architecture). The first suggestions of dismantling the ineffective Artistic and Research Unit appeared at the end of the 60s. Eventually, in the mid-70s ZAB ceased to exit. Originally written in Polish by Anna Cymer, translated by MW, March 2018.